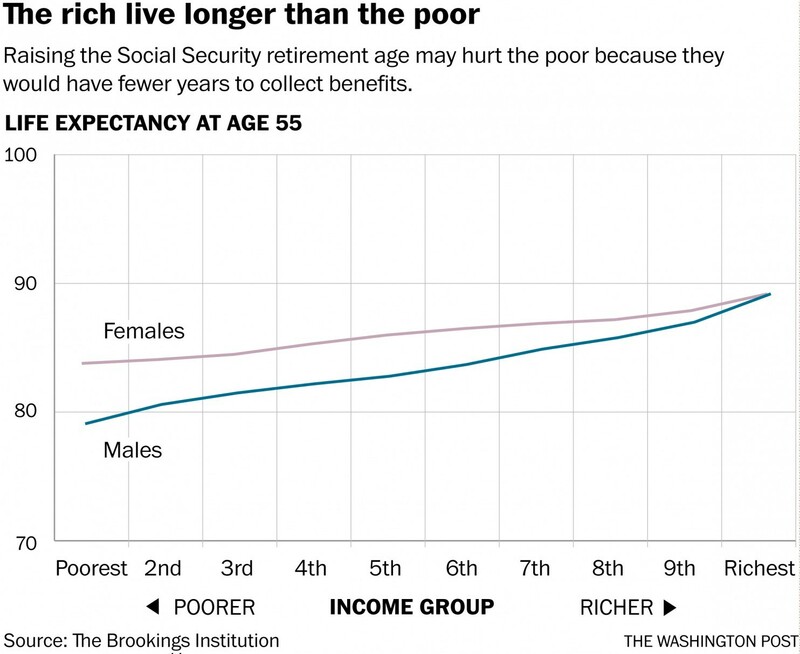 Social Security benefits the poor less than the rich when you look at statistics. Poor men live about ten years less than rich men (top 10%). Middle class men survive about five years less than the top 10%. The survival gap between men and women is stark for the poor, but doesn’t exist for the rich. Why? The poor work harder, usually at menial jobs, sometimes two jobs. They have little money or time to relax. They worry and work themselves to death. Poor women often struggle with two jobs to support children, and increasingly lower wages for the bottom jobs hits them hardest. The rich can relax and even hire folks to worry about what luxuries to buy, what $10,000 a night hotel to visit, what $20 million condo would be the best investment. But if you are middle age poor or middle class, retirement is a major concern, especially income from your earned Social Security benefit. The fact that the richest will receive these benefits for ten years longer than the poorest American is startling. The longer you live, the more you get. 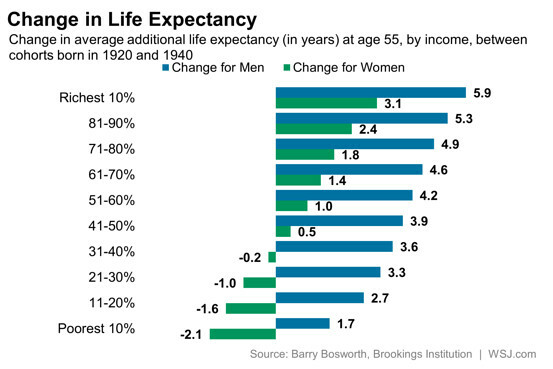 The rich live the longest and get the most. The problem also exists that some of the very rich report very little income for FICA taxation, and the richest and the poorest may have the same reported income (dividends are excluded from FICA, along with capital gains and bank interest). Two individuals would receive the exact Social Security dollar benefit annually for the same tax amounts paid, but the rich would live much longer on average and receive far more total benefits. Common sense says the last thing you should do is reduce the years that the middle class and poor receive benefits. To even the playing field one might even suggest hiking the retirement age for the top five or ten percent to 77 and make up for the ten-year advantage held by the rich in survival rates. The survival rates of the rich are the rates that everyone would enjoy if not burdened by insufficient wages, high prices and few vacation days, sick leave, or affordable healthcare. Since the rich don’t have to work, they do so at their own leisure – gentlemen execs, gentlemen farmers, or just showing up at the club for golf or planning to buy mansion number six or seven. Work can kill you. Women are working harder than ever before and in the past 20 years the life expectancy of the poor woman is down about 2 years, while the rich ladies continue to see more “golden” years. What’s the solution from three of our GOP Presidential hopefuls? Idiots Christie, Rubio and Bush now say they want to substantially raise the retirement age for the American people. This will prevent such modest measures as moving the wage limit up. Even the slightest change might negatively affect the rich – by a couple bucks a week. But raising the retirement age will keep more folks from being retired and hike the number of pathetic souls begging for a job at any price, kill off some of the poor, who won’t have enough money to survive, and give these GOP clowns and their rich toad buddies something to blubber about, while sipping from their $300 bottle of wine and waiting for their $200 round of golf. The rich don’t need Social Security benefits. The middle class and poor will not survive without them. The people, put in power by the wealthy have taken the side of the upper class at the expense of everyone else, whether it is minimum wage hike, free public college, free healthcare, reducing outlandish credit card interest rates or even allowing workers to organize for their protection from unscrupulous employers. Hillary – Just “Bush Lite” on Social Security?